The KwaZulu-Natal Sharks Board Maritime Centre of Excellence (KZNSB) (MCoE) established in 1964, strives to be a leader in environmentally sensitive protection of bathers against sharks and capacity building in the maritime sector. Currently 37 beaches on the KwaZulu-Natal (KZN) coastline are safeguarded with shark safety gear owned and maintained by the KZNSB. The organisation positions itself as "The Only Organisation of Its Kind in the World." "KZNSB is one of the key role-players in coastal and marine tourism in KZN and a major participant of the Oceans Economy, Operation Phakisa. In recent years the role of the organisation has evolved to respond to changes in the province's economy with the institution's operations becoming complementary with the functions of other entities, especially tourism. 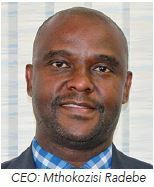 Our protected beaches create a sound basis for exploring other strategic tourism based economic opportunities including the further development of coastal resorts," said Mthokozisi Radebe, CEO of the KZNSB. The KZNSB has a research development and planning division that is responsible for conducting research into the biology of sharks and other marine animals. KZNSB scientists are actively involved in many spheres of shark and dolphin research, including maintaining the South African section of the International Shark Attack File and funding alternative methods of protecting bathers. In-depth research, that has already produced vital insight, is conducted into shark behaviour, feeding and breeding. The KZNSB Act, requires that measures to reduce the risk of shark attack and to attempt to reduce the environmental cost associated with those measures are implemented. As a result, the KZNSB continuously looks at ways to reduce the catch of sharks and other non-shark species. Radebe said, "Initially humans were thought to need protection from sharks but nowadays sharks, as they are in their natural habitat, need protection from humans." As part of the organisation's drive towards reducing environmental impact, the following measures have been implemented: net reduction, introduction of drumlines, beach clean-up campaigns, introduction of pingers to deter dolphins and whales and the shark repellent technology (SRT). "We believe in innovation. In this regard we are vigorously pursuing SRT as part of our efforts to protecting bathers from shark attacks, which is our public mandate. The repellent cable has proven to be safe so far for humans and marine life, and we hopes that it can soon replace the nets and drumlines," said Radebe. Dynamic audio-visual shows and dissection of sharks are both educational and entertaining. There are also boat trips to venture out to sea to watch the shark safety gear off Durban's Golden Mile. Boat trips lasting for two hours leave Wilson's Wharf at 06:30 and they offer opportunistic viewing of marine life including seabirds. The public can enjoy an informative walkabout at the KZNSB's renowned Shark Museum that is home to a variety of life-like replicas of sharks, including an 892kg Great White Shark as well as other marine animals. Furthermore, KZNSB undertakes awareness programmes in bather safety, and presents its programmes to the public, through boat tours, static display areas on site, outreach programmes, website, external exhibitions/displays, social media, radio interviews, publications and advertisements. 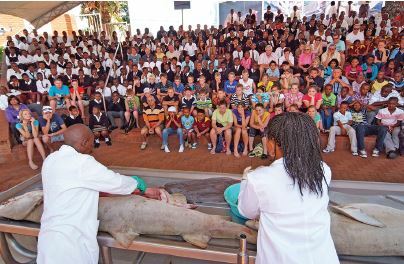 KZNSB has embraced fostering Corporate Social Investment (CSI) in various avenues, mainly the on-going Outreach Programme that delivers a solid marine education to learners in all provinces in South Africa, especially focusing on those learners who do not have the opportunity to visit the coast and know very little about the sea, sharks, and other marine life. Advice on reducing pollution in rivers and on the beaches are all part of the programme presented to the learners and educators. KZNSB hosts beach clean-ups at identified beaches one day a month for two hours. This contributes to the reduction of sea washed debris, including, plastic and other pollution on the popular beaches. The KZNSB invites communities to the beach clean-ups as part of a drive to get them involved in the campaign and ensure that tourists and locals alike have a good beach experience in a clean environment. The KZNSB established a 'Maritime Centre of Excellence' (MCoE) in 2012. The institute facilitates the development of skills in trade, occupation and SMMEs in the environment of ocean and coastal shipping, inland waterways, aquaculture, port activities, maritime security, boat building, boat repair and associated land-based activities, with a focus on youth and previously disadvantaged communities to be beneficiaries of these skills. The MCoE works closely with various Sector Education Training Authorities (SETAs) including the Transport Education Training Authority (TETA), Manufacturing, Engineering and Related Services SETA (MerSETA), as well as Education, Training and Development Practices Sector Education and Training Authority (ETDP SETA) along with a number of accredited training service providers and is a registered ICDL training and assessment centre. Environmentally sensitive bather protection against sharks and thriving maritime skills sector enhance human economic development. capacity building in the maritime sector.